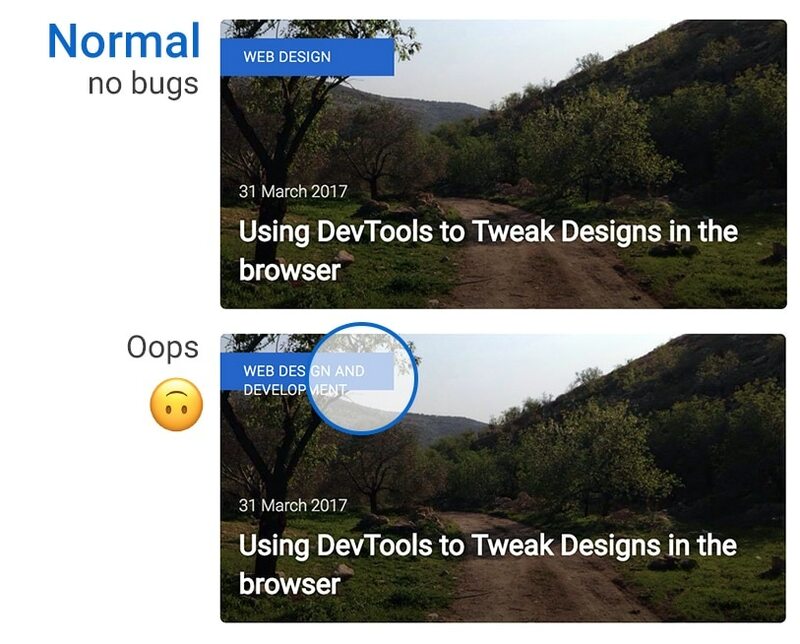 In this article, we will go through different UI bugs from real-world websites so we can account for them from the beginning. Ready? Let's go! This is a toggle button for an accordion. There is an icon on the right side to emphasize that it is clickable. However, when the area is not big enough, the text will overlap the icon. This might happen when we don't account for long content. Notice how increasing the padding creates a safe area for the icon. Now we can be sure that it won't break if the text gets longer. See the Pen A button with an icon by Ahmad Shadeed (@shadeed) on CodePen. When applying the float label pattern for our forms, especially with a button on the right side. We should test this thoroughly to avoid any issues when the label is too long. A solution would be to add position: relative for the button. This will move it above the label. See the Pen Long placeholder by Ahmad Shadeed (@shadeed) on CodePen. In this design, the image is floated to the left and we have an author name on the right. What happens when the name is longer than expected? The UI will break. The issue there is that we only floated the image to the left side. This might cause the author name to move beside it. However, this will only work if the name is not long. To make it more robust, we should float the author image and add overflow: hidden to the author name wrapper. That way, we will get the advantage of block-formatting context (Thanks to Thierry Koblentz for pointing this out in the comments). Or, another solution, use flexbox since it's suitable for that small component. See the Pen Long person name by Ahmad Shadeed (@shadeed) on CodePen. Sometimes there are long links or words in an article. This might not cause an issue with a very wide viewport. But for smaller sizes like mobile or tablet, this will cause a horizontal scrolling and it will be annoying. Please test well when using word-break since it has some differences between browsers. We recommend you to read this article on the topic. This solution is safer and better for links. But for words, I would use word-break. See the Pen Long links / words by Ahmad Shadeed (@shadeed) on CodePen. When we place an article tag over a card, we should only add padding for the spacing. Determining width and height might make the UI break when the tag content is too long. If you want to have a minimum width for the tag, that's fine. We can use min-width with padding around the tag content. That way, the width will be dynamic and the issue will be solved. See the Pen Long Article Tags by CSS-Tricks (@css-tricks) on CodePen. In this example, we have a section title along with a "view more" link on the right. There are different ways to code this in CSS, one of them is using absolute positioning for the link. This will cause issues in case the title was too long. A better solution could be to use flexbox. That way, it will automatically push the link to a new line when there is no enough space. The above technique is called "Alignment Shifting Wrapping". I learned about it two years ago from this article. See the Pen Section header with a link by Ahmad Shadeed (@shadeed) on CodePen. I learned the hard way that using dummy content or simply adding things randomly is not enough. We should add all types of content to our layouts until something breaks. I like to use Heydon Pickering's forceFeed.js for adding content randomly to a specific component. For the floated image, you might also use CSS table layout, which is very robust and simple. 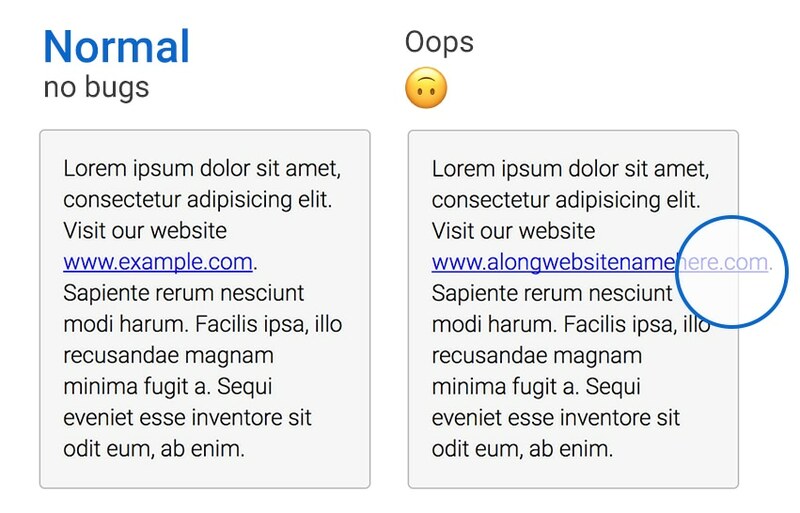 Another example I see too often is long lists with icons using multicolumns, when the content is too long: the text comes below the icon, which is not really beautiful. How to make pop up box float, when the content of web page is larger than the window size. When background contents is scrollable and pop up window often goes out of sight from Windows preview area. In this case, unfortunately user have to scroll to pop up box position for interaction. I’m not sure I understand it well, but can’t you use position: fixed; top: 0;? Give the popup box a position of fixed! To make it more robust, we should add width to both of the elements. Or, even better, use flexbox since it’s suitable for that small component. Giving a width to both elements would create constraints (using percentage or knowing the parent box’s width) and using flexbox does not offer the best browser support. 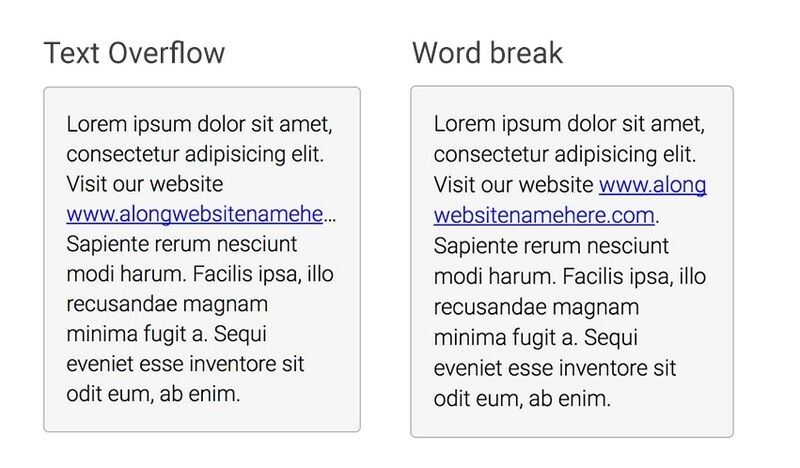 A more robust approach is to style the elements next to a float as block-formatting context (BFC). This has the advantage to work in all browsers, including IE6 (via “hasLayout”). This article seems to be missing the power of “floats and BFCs” as it mostly suggests bugs triggered by absolutely positioned elements which has always been a bad idea in the first place. I think suggesting that flexbox is an easy fix is a miss opportunity to learn good old layout techniques. Hi Thierry, Thanks a lot for your comment. Totally agree with you on using floats. The reason that I showed bugs with position: absolute is that because I saw them in some websites and just wanted to show them. For example, If I want to build something like the media object, I would use float and enhance with Flexbox if needed. You probably don’t want word-break; it was designed to integrate other alphabets into CJK pages, and it breaks lines according to Eastern typography rules, not Western ones. word-wrap is almost always preferable. Thanks for your comment, Taylor. Yes, I’ve seen that in a website I’m working on. But my concern is, how to handle long words in a paragraph without using word-break? Would love to hear your thoughts. Does word-wrap: break-word; not do what you need? Nice article Ahmad, but in my experience this is not (referring to your opening) an “edge case”. This is a very real, frustrating, and frequent one. 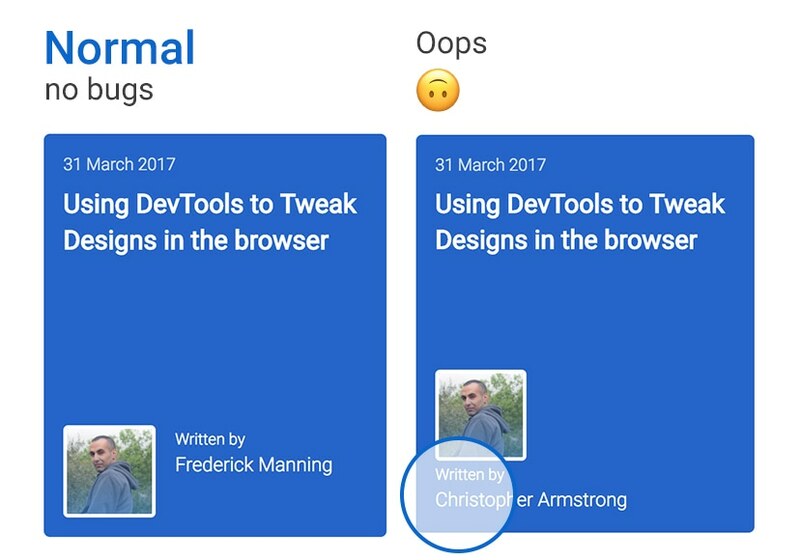 According to [url=https://dev.twitter.com/web/embedded-timelines]the Embedded Timelines code on dev.twitter[/url], the embed seems responsive. When I scale down my browser window, the embed adjusts accordingly. Maybe you have old embed code? For .card .author you can add overflow:hiddean instead float:left. Important is that author must to be a block element. I guess you mean a block-formatting context. I agree, that’s the proper way to style a “media block”. That really points to the pain point I am facing! It is good to see such solutions you have made. I think that what the article conveys the most is the need to test, test, test. Although having fixes to these kinds of problems is very useful, the developer / designer should be mindful of these fringe cases at the time as well. If you don’t see anything breaking, you won’t see anything that needs fixing.